Lilian's Lovebirds, Agapornis lilianae, are restricted to valleys in the Zambezi basin and may number as few as 10,000 in the wild. Progress and outcomes: Since 2014 WPT has been working with Dr. Tiwonge Mzumara-Gawa, who has led several expeditions together with field staff from a local conservation organisation, Zambian students and researchers from the University of Edinburgh. Fieldwork in Zambia added new distributional records as well as worrying range contractions, identified multiple roost sites and highlighted the threat of expanding agriculture and charcoal production. Recently, the team has used new statistical tools to analyse field data to understand the habitat requirements for Lilian’s Lovebirds and infer their current and historical distribution. Using this approach it is possible to identify which forms of land use are most (and least) harmful to the species. A study completed in 2017 showed the critical importance of mature Mopane woodland for Lilian’s Lovebirds, and also the that they are now restricted to a couple of sites on the Zambian side. A second study detailed the factors which led to changes in the structure of Mopane woodlands and how they impact bird communities in general, but with a specific focus on Lilian’s lovebirds. It showed that the impact of human activities is more problematic than that of other animals, such as elephants. Focus of future work: Collaborations with researchers from the School of GeoSciences at the University of Edinburgh are helping understand changes in the status of key habitat. Studies of patterns of nest box use will inform the wide-spread use of this approach for mitigating habitat loss. Water-holes vulnerable to pesticide poisoning will be protected through increased surveillance. With your support we can help put into action measures to protect Lilian's Lovebirds. Where found: S Tanzania, Zambia-Zimbabwe border district, NW Mozambique, S Malawi and SE Zambia to N Zimbabwe. Possibly introduced in Lundazi district, NE Zambia. 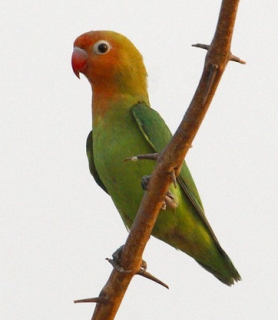 History: Lilian's Lovebird is found along riverways from Mozambique to Zimbabwe along the Zambesi Valley, into Zambia and S Tanzania and into Malawi. Its total population may be as high as 20,000 or as low as 10,000. They have disappeared from the Lower Zambezi river; this may be due to loss of habitat there. Its global range may be less than 20,000 km (Harrison et al. 1997, UNEP-WCMC CITES Trade Database, January 2005). Poisoning of waterholes in S Malawi have resulted in large-scale mortality of lovebirds and other animals (Mzumara 2014). Ecology: Lilian's Lovebirds are found up to 1000m (3280 ft) in mopane and Acacia woodland on alluvium and in riparian forest in river valleys. Prefers areas with fig trees. Birds forage on grass seeds, millet, sorghum and seeds of annual herbs, flowers, berries and leaf buds. Very social, gathering in noisy flocks of 20-100 birds and more, particularly where food abundant. Non-breeding birds form communal roosts in tree hollows where up to 20 birds at a time sleep, hanging on to walls of chamber. Before retiring for the night there is much squabbling and chasing to and fro.